Sunday, November 9th, 1938. In one night of terror, 7000 Jewish businesses and countless homes were attacked and destroyed, 1350 Synagogues burned to the ground throughout Germany, Austria, and the Sudetenland region of Czechoslovakia. 30,000 Jewish men sent to concentration camps. Women and girls were beaten and raped. 91 Jews were killed – the first acts of open murder of Jews. This all occurred within 24 hours: the Night of the Broken Glass. Why? Hatred of Jews. Why else? 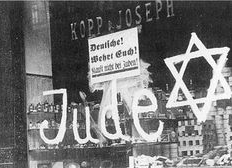 As early as 1936, anti-Jewish signage and limitations on freedom became commonplace. “Parks Not For Jews.” “Jews Not Wanted.” “The Road to Palestine does not go through here. Jews Forbidden.” The Nuremberg Laws were already in effect, and Jewish life was increasingly inhibited, yet the Jews of Germany could not foresee the dangers ahead. Historically inclined to minimize the growing dangers, and persuaded by the very human belief that “it will never get worse than this,” or the collective “we Jews have been through worse,” they bemoaned the circumstances, the lies, the growing animosity of their neighbors but no collective action was taken for the defense of Jewish life that they now realized was indeed in grave danger. By the time “Jude” was painted across windows, cemeteries desecrated, and the vengeance became physically violent, little could be done to quell the flames of hatred.